Rugby in South Africa is gradually moving out of summer sloth and getting ready for action. The same is true for referees, who will be heading off to their camp later this month with the prospect of fitness tests. 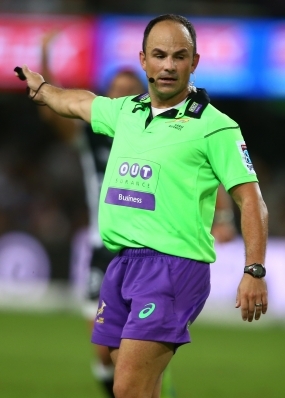 Jaco Peyper, one of the world's best referees, one of them and is taking time to answer readers' questions. I have not seen the incident yet, but the way you describe it, your observation is spot on. The fact that ball went into touch clearly short of the 22m line, means the Glasgow defender has chosen to take the quick throw-in behind the ‘mark’ and therefore carried it back into the 22m – therefore there should be no gain in ground. Please, note though there was an interpretation up to the recent simplifications ‘new law’ adjustments in 2017, where a player that picked the ball up behind the 22m in touch (that went into touch clearly short of 22m as per your example and the rolled past the 22m line in touch area) – did not “carry the ball back into 22m” and therefore can gain ground if the quick throw-in was taken in the 22m and kicked directly into touch. The 2017 simplifications in the new Laws then have made it clear that there will be no gain in ground in your example. Question: I have a question about advantage. At an attacking 5m-scrum, the attacking Red scrumhalf fumbles the ball and knocks-on. As the referee calls "Scrum advantage Blue", the Red scrumhalf grubbers the ball into Blue's goal. Can Blue ground the ball in goal and claim a 22m drop-out as a 'tactical advantage gained'? Or, by grounding the ball, has Blue ended advantage and has to settle for the scrum? BUT the law also states in 8.3(e) that advantage cannot be played after the ball has been made dead. So that means that if the non-offending team has not gained a real and clear advantage yet at the point where the ball has been made dead – advantage cannot be played further to award the 22m – but a return to scrum for first infringement. Hope it makes sense technically? Question: (This question is from an ARU Law exam) - Red are in possession and a maul forms - Blue steal the ball, but the maul collapses legally - The ball is available to be played by blue, and the referee calls 'use it' - Blue fail to use it, and the referee blows the whistle and awards a scrum. Question: should it be a scrum to Red, because Blue didn't use it when instructed? - or should it be a scrum to Blue, because Red were in possession on the ball when the maul commenced? 17.6(g) When the ball is available to be played the referee will call “use it”. If ball is not played within five seconds the referee will award a turnover scrum. Hope the logic is easy to follow! Question: This week we had news that Mathieu Bastareaud of Toulon had been cited and suspended for rudely insulting an opponent. Under what law may this happen. What sort of insult would meet the "red card" criterion? Citing falls outside the referee's realm and independently administered by a citing body, therefore not something for referees to comment on the processes. A referee can deal with these incidents under Law 10(4)(m) “Acts contrary to good Sportsmanship”, should he have a clear incident with clear facts (not hearsay). And a serious degrading insult/derogatory remark may well, be judged a Red Card by the referee himself – but that does not equate to a citing – mere sanction during the 80 minutes. In practice, citing is based on serious Law 10 Foul Play infringements as per our Law book (that is where the red card test is used), but there are additional grounds for citing taken up in Regulation 17 Discipline. This may include “bringing the game into disrepute” amongst others and the citing commissioner follows these procedures independently. See the link below for more details.